One of the interesting things about restoring vintage watches are the variety of times you feel like you are walking in someone else's footsteps. You often come across watches that have lots of service marks inside the case. Of course, the opposite is also true. I really enjoy coming across a vintage watch that looks like it was never even worn, let alone taken apart since it first left the factory. Those situations are much less frequent. Sometimes I come across a watch that makes me wonder who was the last person to "work" on it. My latest project is a good example. It's a 1966 Dateline A-581. This model was made through 1969. The Dateline A-581 came in a stainless steel case with silver hour markers and hands that have black highlights. Being a Dateline A-model, it has a 17 jewel 694A movement inside, basically the equivalent of the 689 automatic movement used in the Accumatic line, but with a calendar complication. My project watch has been waiting patiently for it's turn to visit the spa for so long that I don't even remember when I picked it up. The only thing I know is the date doesn't want to advance. The Spiedel bracelet is not original and I detest the spring-loaded "one size fits all" ends - as they eat into the lugs of the watch. So this bracelet will have to go. The case is a one-piece design and once the crystal is removed and two-piece stem is separated, the movement will lift up and out. This watch has a silver reflector ring surrounding the dial - that will come out first. The movement is secured inside a movement ring. The two are connected by "case clamps" held down by screws. One of the signs that I'm walking in someone else's footprints is when I find the wrong screws in certain holes. Often movement use different screws in different locations. The last guy (or gal) to open this watch put a longer train bridge screw in the automatic framework - and by doing so dented the mainspring barrel. This sort of damage will bind the mainspring inside and lead to dramatic changes in spring tension as the watch runs. So I will need to replace this barrel. Of course, if one screw is put in the wrong place then another screw will have to go into another wrong space. That was the situation with this watch - several screws where in the wrong holes. Fortunately the only damage was the barrel. Here's a nice shot of my watch timer but the reassembled movement is a little blurry... oops. Did I mention I was walking in the footsteps of a potential "hack"? This balance is all whacked. Apparently the previous guy didn't have a timer. Fortunately the balance is very easy to adjust so I should be able to fine tune things much better. First I'll adjust the beat error by moving the hairspring stud. 0.4ms is a good stopping point. Next I'll adjust the regulator index and slow the watch down. I usually check the watch dial up and dial down. They should be the same or very close to each other. In fact, glucydur balances like on the 694A are machine-poised at the factory so the watch should run the same in all positions. I replaced the crystal with a 30.6mm PHD crystal and installed a fresh alligator strap. This watch is now a real looker and looks a great as it runs. As and added benefit, all of the screws are in their proper places. In 1961 Hamilton introduced an unusual experiment - wooden dials. Five different men's models featured dials laminated with exotic woods. The manufacturing process proved problematic and the models were not well received by the public so the model line was dropped after 1962. One of the five men's models is the Sherwood N. It's an automatic model in a 14K gold case and featured a Mexican Mahogany wood dial. If the Sherwood N looks familiar it's probably because it's modeled after the 1957 Automatic K-203. Sherwood models are extremely rare. Including the Sherwood N, I've only come across three of them. I don't know how many were made but you very rarely see them for sale, and certainly not the the Sherwood N. I happened to have a friend send me his for a little TLC. As received, it was in decent shape but a little beat up. A lot of times when you see Sherwood models the dials can be rough but this one looks to be in good condition. The case back unscrews to reveal the movement. Being a 1960's K-series model, the movement inside is a 17 jewel Hamilton 667 movement. Based on the looks of it, it's been quite a while since this one has been overhauled. It has been overhauled quite a few times in the past 57 years, based on the various watchmakers' marks inside the case back. Although the catalog image doesn't say so, these hands are silhouette hands with radium paint on the back. I'm surprised that hasn't taken it's toll on the wood dial. I'll remove it in the cleaner. The crystal on the watch has served it's purpose and taken a few shots in protecting the watch. Replacing it with a fresh crystal will be a nice improvement. 30.1mm will do the trick. The reassembled movement is now ticking away with a good motion. Let's see what it looks like on the timer. Hmm... something inside is making a little extra noise. I'll give the hairspring another cleaning. There - all better. Everything is looking good. The movement is reinstalled in the case with a movement ring to hold it inside. This watch looks great but it's a little hard to photograph. You can barely see the second hand against the dial but when the light catches the gold it really sparkles. 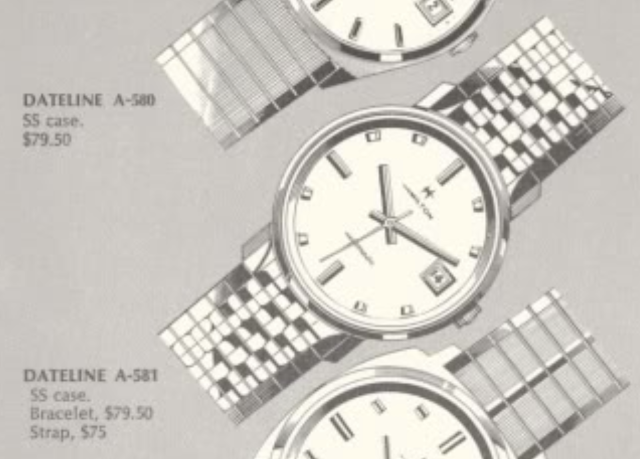 I think one of the reasons these models weren't very popular is the wood presents a very casual look to what would arguably have been a very elegant watch. Priced at $150 in 1961, that was about $1250 in 2018 dollars. I think the wood dial on a K-203 would be like wearing jeans with a sport coat and tie. Some people can pull that off but most people wouldn't even try. Today the appeal of the Sherwood models is their rarity. Anyone can go into a jewelry store and purchase a modern Rolex, if you've got the scratch for it, but very few people will ever find a Sherwood N in the wild today. On any given day it's easy to find watches with Hamilton movements in solid gold cases with diamonds on the dial. They usually come with high price tags but nine out of ten of them aren't even authentic Hamilton models. However, there are plenty of authentic models with diamond dials but you need to be careful when you see them for sale. Diamonds became available on Hamilton watches in the 1940s, solely for specific solid gold models. 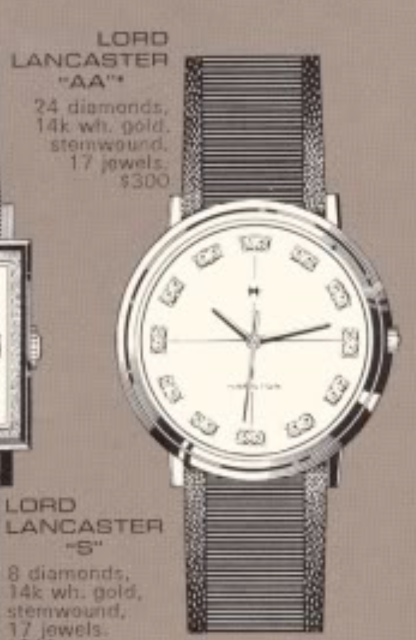 Then in the 1960s Hamilton introduced the Lord Lancaster line of models with diamonds on the dials or integrated into the case. Those models came is a variety of case materials from solid gold to rolled gold plate. One of the last models to be introduced was the 1968 Lord Lancaster AA. It was made until 1969. The Lord Lancaster AA is a very uncommon model. In fact, I've never seen one for sale until recently so I managed to pick it up. It was an expensive watch at the time at $300 and it's still and expensive watch today. The Lord Lancaster AA came in a solid 14K white gold case and it features 24 diamonds mounted to the dial. It's one of the few models to feature a sweep second movement. My Lord Lancaster AA project watch didn't come with an original strap, which would have been interesting to see. A lot of times they are suede and it's hard to tell from the catalog depiction what the strap was really like. Other than a lack of strap, my project watch is in excellent shape. The case is very crisp and has sharp edges. I'll be sure to protect them as I try to clean it up. If you see a watch that you believe to be a Hamilton model, be sure to check out the case back. If it doesn't say Hamilton then you can be sure that it's not an authentic model. Tucked inside the one-piece case is a 17 jewel Swiss-made 688 movement. The only US-made sweep second movement available at the time was the 735 / 736 and it would have required a deeper case. The 688 is very slender. It's basically a manual-winding version of the 689 automatic without the automatic framework tucked onto the back. All authentic Hamilton models made before 1970 will be clearly marked with Hamilton W. CO. inside the case back. If you don't see that you can be sure the watch is not authentic. Everything is ready to be put back together with fresh lubricants in all the wear areas. The reassembled movement is ticking away with a good motion. It's off to the timer. Not too shabby. The amplitude is under 250 but I haven't fully wound the watch yet. I'll leave it running a smidgen fast for now. The original crystal had a deep gouge in it so I will replace it with a new 29.4mm crystal. In my last post I told the story of how the Hunchback of Notre Dame wanted to retire. Unfortunately, he wasn't able to, so he kept his ad in the paper, "Wanted Bell Ringer, apply in person at the Cathedral of Notre Dame". After a few days another applicant arrived and Quasimodo checked him out closely. It wasn't hard to realize that this guy had no arms either. So Quasimodo told him, "No way! The last guy who applied had no arms and he ended up getting killed. I'm sorry but I can't let you do it." The man said in reply, "Oh please, Mr Quasimodo. That man was my brother and with him passed away we are in terrible straights. The responsibility for our family has fallen to me and I have no other way of providing for them!" Again Quasimodo was moved by the man's selfless dedication to his family so he said, "Okay, it's 1:00, let's go ring the bell". Together they climbed to the top of the bell tower. Quasimodo said, "okay - do your thing" and the man steadied himself, leaned back and then quickly swung forward and slammed his forehead into the bell. "BONNNGGG", the bell clamored as it swung away and as it came back it knocked the still-dazed man off the church tower and he plummeted to his death. Quasimodo ran down the stairs and out the front door, parted the crown and stood over the body. The same policeman was there and said, "Well? Do you know this guy?" The Hunchback said in reply, "No - but he's a dead ringer for his brother!" Hamilton watches tend to look familiar to each other. Although models have different features, details like the solid gold numerals are the same style and size, as is the Hamilton logo, and the construction of the cases are very similar. In the 1950's I think Hamilton went through the equivalent of their "ugly stage" of puberty. Some of the models really bordered on odd-looking with horological bucked teeth and bowed legs. 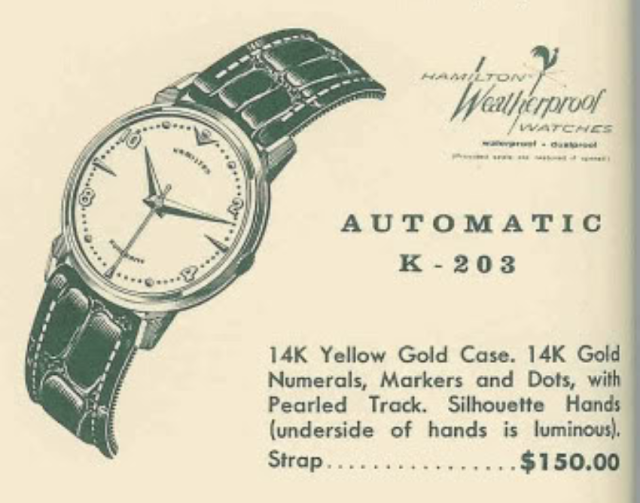 Check out the 1954 Hamilton Kenmore if you need an example. 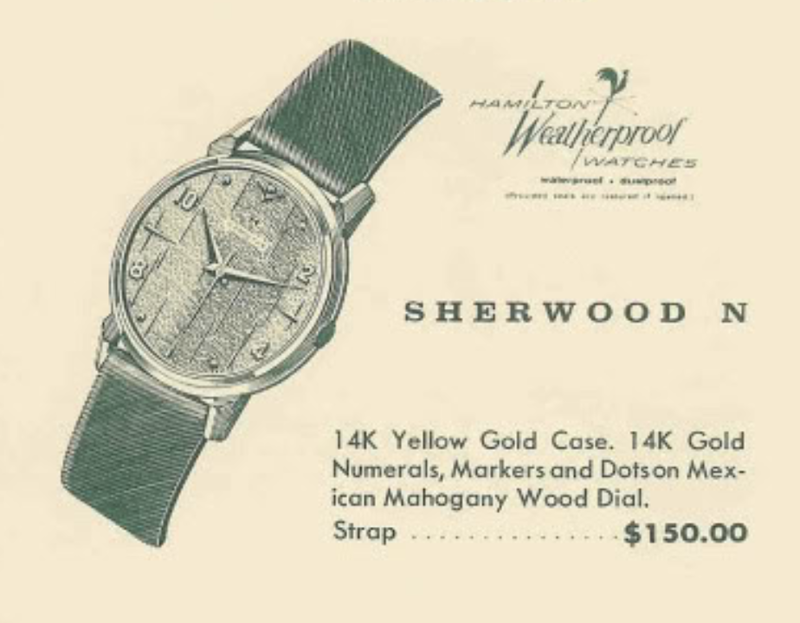 Furthermore, you will find a lot of jeweler-recased watches from the 1950's where a jeweler recased a 1930's Hamilton movement in an aftermarket case, either because the original case wore out or perhaps it was scrapped for gold. These watches often say Hamilton on the dial but they just don't look quite right. However, there are some legitimate models from the time period that upon first blush you might wonder, "Is this really a Hamilton?". One of them, I think, is the 1953 Berkshire. It's not an ugly watch, but it's not a dead ringer for it's brothers, either. I really can't think of older models that look much like the Berkshire. The Berkshire may mark the first use of dauphine-style hands, although lots of later models use them too. The flared lugs remind me of the Trent - but that model came out in 1955. 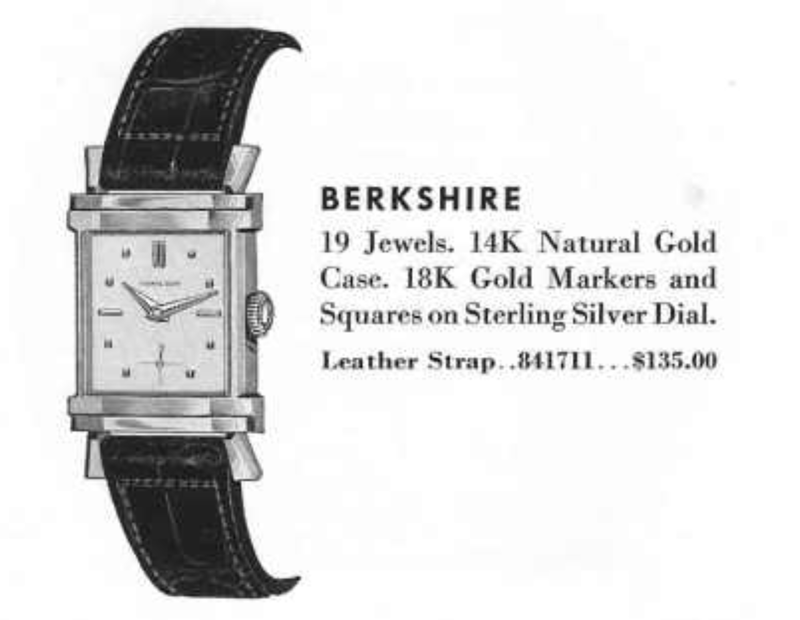 The Berkshire was shown in the 1953 catalog and then again in the 1955 catalog but appears to have missed the cut for 1954. In 1955 the retail price of the model dropped by $10 to $125... still over $1,150 in today's dollars. It was an expensive watch, probably because the Berkshire was presented in a solid 14K yellow gold case. Originally the Berkshire was equipped with a 19 jewel 12/0 size 754 movement. I suspect you might find a 1955 version with a 22 jewel 770 movement. The catalog didn't mention the jewel count in 1955 and the 770 came out mid-year. My Berkshire project watch is a very nice original-looking example. The crystal on this watch is very small - I didn't measure it but it's probably the smallest crystal I've come across to-date. This watch has an original Hamilton gator strap - a rare find. It also has an original Hamilton 14K buckle - an even rarer find. The case back shows some wear but it's mostly unremarkable. For the record, the finger prints on the dial are not mine. I can tell by the notch on the side that this dial has been refinished at least once. The 754 movement replaced the 982M movement that was used until 1952. Like the 982M, the 754 has orange enamel in the engravings and is more finely finished than the other 19 jewel 12/0 sized movement, the 753. This particular movement is a bit dirty, it's fully wound and not running. Notice the regulator is set to full-slow. The back of the dial has a couple of sets of numbers so it's likely been refinished more than once. Everything is cleaned and readied for reassembly. Check out the side of the barrel - it's been dented in order to install a Swiss tang-style mainspring instead of a T-end spring like Hamilton used. So the mainspring inside isn't an original Hamilton part. As long as it's the correct size, length and strength it should work. The reassembled movement is ticking away with good motion. I set the regulator back to the center. Hmm.... it's running slow, the beat error is a bit high and the amplitude is a bit low. The order of operations at this point is to fix the amplitude, then the beat error, and then the beat rate. I suspect the amplitude is related to the mainspring. I'll replace it with an unaltered barrel with a correct mainspring and see what happens. There... the amplitude is increased nicely. Next I'll try to better cetner the balance's impulse jewel by adjusting the position of the hairspring collet on the balance staff. That's easier to say than do, and it's not really that easy to say. Alright, a beat error of 1.4ms is well within my specs. Now I can give the regulator a slight tweak and speed the beat rate up a smidgen. Well, the finished watch looks a little better than what I started with but it didn't look too bad to begin with. I very gently polished the case so that I wouldn't lose any of the edge details. Beyond that I didn't do too much to the outside of the watch. The big difference is it's now running - and that makes all the difference in the world.